Just because you know how to use a chef’s knife, doesn’t mean you necessarily know how to buy one. Learning your knife skills is an important milestone in culinary development, but a question many novice food truck chefs walk away with is, “how do I select a chef’s knife of my own?” And this question comes with well-deserved consideration. Let’s take a look at how to find the best chef’s knife for you. In order to start the search for a sound chef’s knife to use in your food truck kitchen, it’s important to first understand the anatomy of a knife. Knowing these basics will equip you to make an educated decision on your first cutlery investment. The most important components of a chef knife’s anatomy include the edge, heel, bolster, handle and spine. Bolsters (also known as the collar, shoulder or shank) are only found on forged cutlery and are a large part of what makes the balance and weight of forged cutlery so different from stamped cutlery. Bolsters are often preferred as they can be used as protection for fingers when gripping the knife. The right style for you completely depends on your grip and how your hand feels comfortable. Many chefs find that the bolster adds stability. The edge of the knife is the sharp part of the blade. Take notice of how the blade runs from the heel to the tip, this is called the line of the blade. If there is a slight curve from the heel, the knife will be easier to rock back and forth when mincing or chopping. The blade should be sharp straight out of the box, and kept sharp in order to maintain performance. The best handle for you will be the one that feels the most comfortable and secure. When you pick up a knife the shape of the handle should feel natural in your hand and should not bring any strain or feel slippery When you hold the knife down to a cutting board, you should be able to slice, chop and rock the knife back and forth without your knuckles contacting the cutting board. Unless it’s a Japanese style chef’s knife, the heel is the thickest and broadest area of the edge. The heel is perfect for all tasks that require more force, such as cutting through tendons or cracking open the hard outer shell of a melon or winter squash. A good heel will allow a steady rocking movement with the knife and will not stop suddenly or rock too far backward when mincing or chopping. This is the top portion of the blade and may have a squared edge. Avoid knives that do not taper at the tip of the knife’s spine. Thick tips are difficult to work with and cannot assist with piercing food or cutting very small portions. The list of characteristics to pay attention to when trying out knives is short, but important. It will pay off in your long-term investment to give special attention to how the knife feels as you try it out. It should feel comfortable, like a natural extension of your hand. The balance of a knife is just as important as the weight and size. Balance refers to how the weight of the knife feels when it’s held in your hand. If the weight of the knife keels overtly towards the blade or if the weight falls back into the handle, the balance may not be right for you. The knife should feel evenly stable when held, as if it were an extension of your own hand. When purchasing your first chef’s knife for your food truck kitchen, keep in mind that finding the right one is a personal decision. An 8-inch knife is a good standard size to begin with. At this size, it’s easier to manipulate the knife for multiple functions including slicing, dicing, mincing and chopping. A 10-inch chef’s knife is for performing heavier jobs such as breaking down a chicken. A 6-inch knife is the easiest for small hands to manipulate, but may not hold up for larger items. 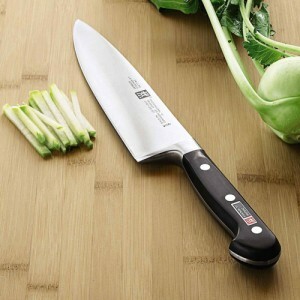 Ask a group of chefs which is better – a heavier or lighter chef’s knife -and you will receive a variety of answers. One answer that is consistent is that the ideal weight of your chef’s knife should suit your preference. Some chefs prefer the heft of heavier knives to help cut with force, while others find heavier knives fatiguing and enjoy the free-flowing movement of lighter designs. Experiment with a few different weights before settling on what to purchase for yourself. You can purchase a Chef’s Knife online or at a local cutlery dealer. Let us know what style and brand you pick up. If you have issues with your Chef’s Knife, share these problems in the comment section below.